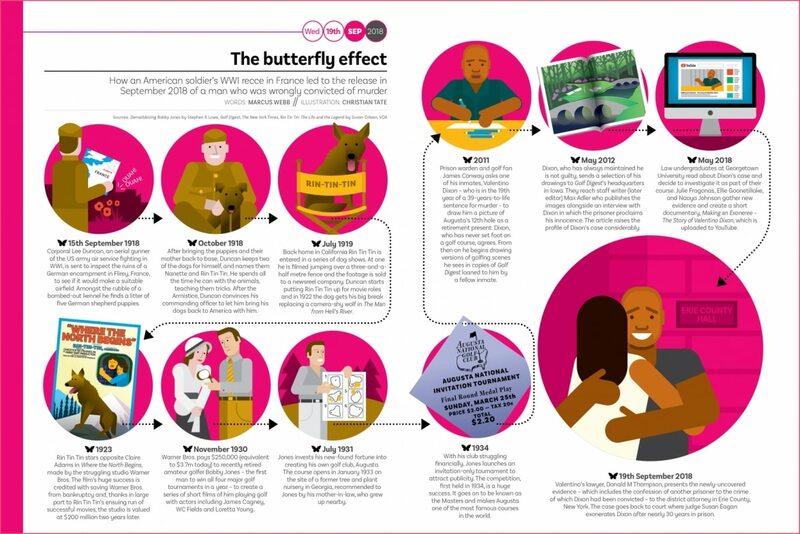 The butterfly effect: How Rin Tin Tin rescued an innocent man from jail in 2018 from Delayed Gratification, the Slow Journalism magazine. It has all the makings of a Hollywood classic. Having been rescued as a puppy from a bomb site in World War I, the German shepherd dog Rin Tin Tin went on to star in 29 movies during the 1920s and early ’30s – while off-screen, the dog superstar himself rescued a real-life wrongly convicted prisoner from jail. The only snag: Valentino Dixon was released in September 2018, 86 years after Rin Tin Tin had gone to doggie heaven. Follow the chain of events in our epic montage sequence above to find out how the legendary dog unwittingly became one innocent man’s best friend. This infographic was published in DG#32. Pick up a copy in our online shop or take out an annual subscription using the promotion code ‘SLOWNEWSDAY’ for 10 percent off.